The ongoing 2019 Mobile World Congress in Barcelona is all about two new technologies that smartphone vendors expect to boost the market back to growth after a tough 2018, but while Oppo jumped the gun on Saturday with an obligatory 5G-related announcement, the company stayed mum on foldable plans we've known for quite some time are in the works. After the stunning Huawei Mate X was unveiled on Sunday, however, Oppo Global VP and President of China Business Brian Shen decided to join the fun by sharing a few hands-on images on social media of a device that would have felt incredibly exciting... last week. That's because we're essentially dealing with the same vision Huawei is prepared to make a commercial reality soon, only not ready for primetime yet. Granted, no one's been able to get their hands on a working Mate X to check out Huawei's ambitious out-folding design in action either, but Oppo seems significantly further away from polishing and perfecting a similar concept. In fact, the company, which by the way is the world's fifth-largest smartphone manufacturer, is unsure of the "improvement in user experience" provided by a design hailed as groundbreaking and game-changing by a number of its rivals. 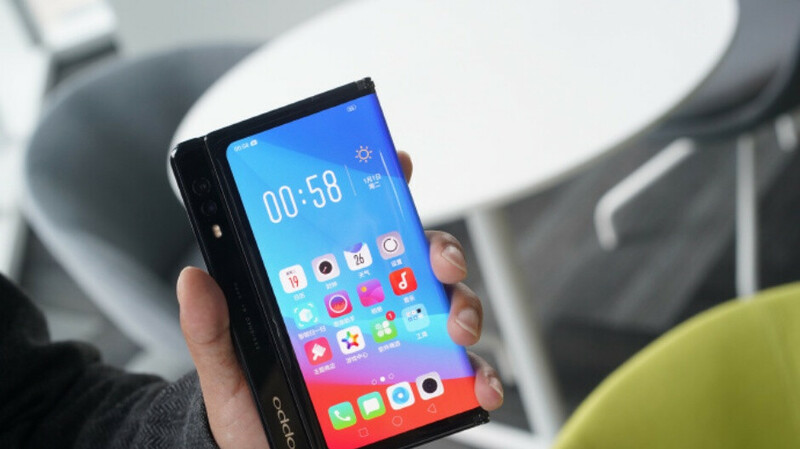 Given that concern, Oppo is still trying to gauge consumer interest, with Shen asking people to share his photos and express their honest opinions before the company makes up its mind whether or not to mass-produce this thing. Of course, it's hard to tell exactly how Oppo's unnamed product could differ from the Huawei Mate X based on a few snapshots, as the two certainly appear to have a lot in common at first glance. Unlike the Samsung Galaxy Fold, the extra-wide OLED screen on these bad boys wraps around both sides of the phone tablet when folded, technically allowing for a much more seamless transition between the two states and, with the help of a handle of sorts housing two or three cameras, it creates a perfectly flat handset look with active displays on both the front and back. If Oppo can pull all that off and undercut the insanely expensive Huawei Mate X, we say the company should give mass production a shot. After all, competition is the only way to drive innovation in a fledgling market category. another early unfinished prototype just like the mate X. Mate X looks like next gen compared to Galaxy Fold. This one needs a big hand to hold, and may not get into the pocket. Design should be from compact to big, not big to bigger. All Chinese OEMs are like one big company. No originality and all copy the same source.